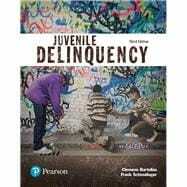 Juvenile Delinquency provides an affordable, thought-provoking look at the criminal justice system that uses clear writing and eye-catching visuals to get your students straight to the important concepts. The emphasis is on delinquency across the life course. By focusing on the core concepts, students will gain true understanding of the material, without becoming overwhelmed with unnecessary information. The book's conversation-starting pedagogy encourages active participation in learning, moving students beyond memorization by engaging them in the latest research findings and current events shaping the field. The Third Edition features new Voices of Delinquency stories in every chapter, expanded discussions of special juvenile delinquent populations, a new section on police attitudes toward juveniles, and updated figures and tables throughout. Juvenile Delinquency, Third Edition is also available via Revel™, an interactive learning environment that enables students to read, practice, and study in one continuous experience. Clemens Bartollas, Ph.D., is professor of sociology at the University of Northern Iowa. He holds a B.A. from Davis and Elkins College, a B.D. from Princeton Theological Seminary, an S.T.M. from San Francisco Theological Seminary, and a Ph.D. in sociology, with a special emphasis on criminology, from The Ohio State University. Dr. Bartollas taught at Pembroke State University from 1973 to 1975, at Sangamon State University from 1975 to 1980, and at the University of Northern Iowa from 1981 to the present. He has received a number of honors at the University of Northern Iowa, including Distinguished Scholar, the Donald McKay Research Award, and the Regents’ Award for Faculty Excellence. Dr. Bartollas, like his coauthor, is also the author of numerous articles and more than 30 books, including previous editions of Juvenile Delinquency (Allyn & Bacon, 2006), Juvenile Justice in America (with Stuart J. Miller; Prentice Hall, 2011), and Women and the Criminal Justice System (with Katherine Stuart van Wormer; Prentice Hall, 2011). Frank Schmalleger, Ph.D., is Distinguished Professor Emeritus at the University of North Carolina at Pembroke. He holds an undergraduate degree from the University of Notre Dame and both master’s (1970) and doctoral (1974) degrees, with special emphasis on sociology, from The Ohio State University. From 1976 to 1994, he taught criminology and criminal justice courses at the University of North Carolina at Pembroke; for the last 16 of those years, he chaired the university’s Department of Sociology, Social Work, and Criminal Justice. The university named him Distinguished Professor in 1991. Dr. Schmalleger has taught in the online graduate program of the New School for Social Research, helping to build the world’s first electronic classrooms in support of distance learning through computer telecommunications. As an adjunct professor with Webster University in St. Louis, Missouri, Dr. Schmalleger helped develop the university’s graduate programs in administration of justice as well as security administration and loss prevention and taught courses in those curricula for more than a decade. A strong advocate of Web-based instruction, Dr. Schmalleger is also the creator of numerous award-winning websites. Dr. Schmalleger is the author of numerous articles and more than 30 books, including the widely used Criminal Justice Today (Prentice Hall, 2017), Criminal Justice: A Brief Introduction (Prentice Hall, 2018), Criminology Today (Prentice Hall, 2017), Criminology: A Brief Introduction (Prentice Hall, 2018); Criminal Law Today (Prentice Hall, 2017), and Corrections in the Twenty-First Century (with John Smykla; McGraw-Hill, 2018). He is also the founding editor of the journal Criminal Justice Studies and has served as an imprint adviser for Greenwood Publishing Group’s criminal justice reference series. Visit the author’s website at www.schmalleger.com.